Well, Happy Fall-tivities everyone! We are approaching the treasured “Fall Solstice” (Yes, I am aware that there is a fall equinox which was Sept. 22.) I am referring to the fall solstice, where we will dress up as our best Michael Jackson, Patrick Swayze and other celebrity zombies, or skimpy harlot versions of our favorite childhood cartoon characters. That’s right folks, I’m referring to HALLOWEEN! But I would like to address something different today; the oddity that is Candy Corn. This season, whether you absolutely love it or your teeth shake with fear and your stomach rises, you must and will face, if you haven’t already, the waxy icon that shimmers white, orange and yellow. There is really little actually known about the this candy. The main facts are that they were made by some dude 120 years ago. He was also probably the first person to die from diabetes. A victim of his own candied creation. …OR that’s what they’ll tell you! Legend tells that this man stole the recipefrom Native American witch doctors that would use Candy Corn to raise dogs and cats from the dead in order to protect their people from rodents with the hantavirus. They would alsouse them as an alternative to arrowheads to give their enemies instant diabetes in battle. After the recipe was stole by the white man, witch doctors cursed white men to generations of obesity and cavities. And here we are today! 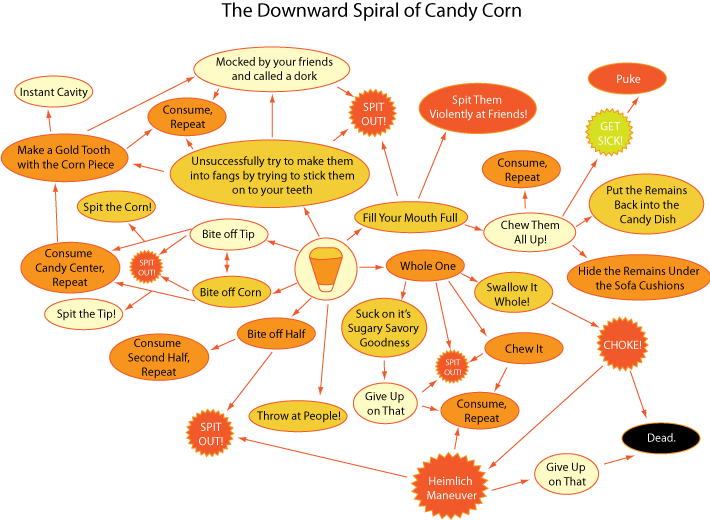 Now there are many many ways to eat candy corn, with different results as well. I took it upon myself to test every possible scenario of candy corn eating and binging. As you can see there more that 33 possible scenarios, mutiplied over and over by stomach-aching repetition. So that’s Candy Corn for you. And it doesn’t matter how many times you let burned, you’ll do it all over again this time ever year. Happy Candy Corning to you! Let There Blog is back with fiery vengeance! With new passions to burn into your retinas! I have returned The Far East. Where I have learned the ways of the Thai. I can talk or write about my travels for days upon days upon weeks upon years… But upon my enlightening experiences, the best way, the only way, to tell you what I have experienced is through THAIKU. Yes that is right! Thaikus are my Haikus about the Kingdom of Thailand. But it is truly best and wise for you to indulge my proverbs through AUDIO form. That right, AUDIO! So either read on, or feed your ears my delicious words that would charm a fire breathing Griffon to a restful purr. meep meep! Move off the road dog! It is well known fact that I am not the sharpest cutlery the kitchen. It took 22 years of my life to figure out how to use the stove and boil something. I hope to one day know how to use a skillet, but one thing at a time please. But I am an idea man. I know how to start something and run with it. I bet you I could PICKLE! Doesn’t seem to hard right? All you need is water, salt, vinegar, a big jar, and the patience of an wise old soul. It is not fair that Pickles, or should I say “Pickled Cucumbers,” get the sole credit and title of “Pickle” when there are many things that can be pickled, or should I say, could be pickled! 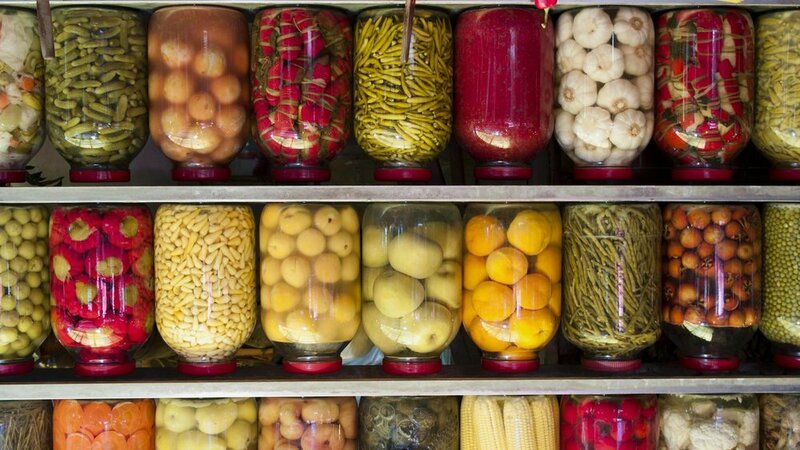 Starting every 3rd week of all months that have 31 days, I will be leaving work early to run my own Pickled Fruit stand on the side route 7 in Alexandria. We will start slow with only pickled grapes and pickled bananas, but hope to get to pickling Strawberries, Pairs, and Papayas soon after. You haven’t live until you’ve had a piping hot Pickled Papaya. Don’t like the pickled products? Fine, try this one on for size! On every 2nd and 3rd Wednesday night of the summer months my Pickled Fruit stand will roast candy in a portable wood stove. Roasting mallows is a thing of a primitive past. The new trend will be slow cooking Starburst, Tootsie Rolls, Circus Peanuts, and Cow Tails over a semi open fire. Itwill called Michael’s Pickle-Fru and Roasted Sweets Stand. Prices will be extremely economical and for every 20 pounds of fruit and sweets sold, Michael will give a dollar to a fund that builds public fire pits for the homeless. I am taking volunteers to help donate candy and fruit produce. Note: there will be no apple pickling. All donated apples will be eaten on site.